A Trout in the Sea of Cortez by John Salter, a Mysterious Review. Review: A Trout in the Sea of Cortez is John Salter's first full-length novel, and while it might not be categorized as a murder mystery by most definitions, it is an interesting if somewhat over-long work of fiction. Read as a mystery, the first three-quarters of the book represent the background material. The principal character is Dennis Pratt, a part-time hazardous waste employee, married to an apparently successful mortgage broker, with a daughter in college, living near Fargo. Pratt smokes too much, he drinks too much, and he suffers from obsessive-compulsive disorder, but none of these concern him as much as believing his wife of almost 20 years is having an affair. She has lost a lot of weight, has whipped her body into shape, and seems to be spending a little too much time with the local dentist. Then there's the case of the missing mercury. Though his company doesn't handle highly toxic metal, he accepts $500 to take it anyway, thinking he can come up with a way to dispose of it. Striking a deal with the father of a girl who's selling used balls on the course where he plays golf, he discovers the mercury missing when he tries to buy it back. Worse for Pratt, the man is found murdered on the golf course and his daughter has vanished. And so begins the mystery, soon after Pratt and his wife, together with three other couples and, no surprise, the dentist and his girlfriend, have arrived in the resort area of Los Cabos in Baja California, Mexico. The authorities in Fargo suspect Pratt of the murder, and the fact that he has apparently fled to Mexico seems proof of his guilt. Though the denouement isn't all that original, it cleverly unfolds in a way that may take the reader by surprise. 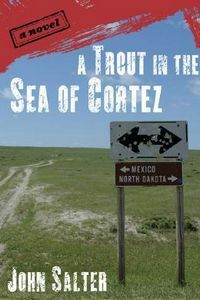 Salter has tried to combine two books in A Trout in the Sea of Cortez, and has generally succeeded. There's the well-written novel about a troubled family man, a husband and father who loves his wife and daughter, but is having difficulty adjusting to middle age. Then there's a murder mystery, really just a short story but a good one, that's been well integrated into the novel. As a mystery reader, one might have hoped for a little less of the former and a little more of the latter, but it's definitely worthwhile seeking this book out. Acknowledgment: John Salter provided a copy of A Trout in the Sea of Cortez for this review.